In this month's newsletter: find out about the Certifed Actuarial Analyst (CAA) and the exam registration closing date; come and meet us at the East Asian Actuarial Conference (EAAC); complete a survey on diversity; read about the opening of our Beijing office; view our articles on recent university trips; save the dates for Momentum and the International Mortality and Longevity Symposium; read an article on the joint IFoA and New China Life event; volunteer for us; hear an update from the international board and committee meetings; hear new information about paying for exams online; and view our corporate publications. I visited South East Asia, Hong Kong and China in early May with our President, David Hare, joining me in China. Member and CPD events were held, and the feedback was very positive. These events are a great opportunity to meet our members in the region and I look forward to more in the future. We are pleased to report that we have been awarded a business licence in China, the first actuarial association to receive such a license. This enables us to better serve our members in the region. During my trip I also visited Myanmar and the Philippines. In Myanmar meetings took place with the Deputy Finance Minister, the Education Ministry, Myanmar Insurance (the state insurer and regulator), and eight of the country’s newly formed insurance companies. We will be building on the momentum from these meetings during the coming year and will continue our active engagement with our members in China and SE Asia. Exam registration for the first CAA exam session, Module 0 closes on Friday 18 June. It has been many years since the IFoA offered a new membership qualification. The aim of CAA is to provide an internationally recognised credential for professionals working alongside actuaries, and to extend actuarial knowledge to a broader reach of technical and analytical roles in the financial services industry. As well as a level of technical expertise, the qualification develops wider skills such as communication and professionalism. 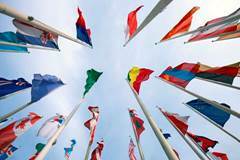 Within a month of launch, the IFoA had already seen interest from over 30 countries, confirming the global appeal of the CAA. We would like to draw your attention to the following deadlines as the closing date for registration draws closer. Study material is available, for those considering taking Module 0 with us in August. You can read more about the CAA and its benefits, how it fits within the global market and how the CAA can help you in your career by viewing our web pages. The IFoA is delighted to be a Gold Sponsor of the 18th East Asian Actuarial Conference (EAAC), which will be held in Taipei, Taiwan 12-15 October 2014. The IFoA is keen to reach out to as many members in the region as possible during this high profile actuarial conference. Key members of our Executive, including Chief Executive Derek Cribb and Membership Director Memoria Lewis, will attend and would be delighted to meet as many of you as possible at the conference. Once again, the IFoA will have a stand where you will have the opportunity to find out more about the IFoA member services, research, volunteering for the profession and also the new Certified Actuarial Analyst Qualification (CAA). Book your place now and we will look forward to seeing you in October. The needs of our increasingly diverse membership are constantly evolving and the IFoA continues to evolve in response to the needs of its membership. We are acutely aware that the IFoA is a global organisation and that the needs of members will be different depending on where they work, what they are doing and what stage of their career they are at. We welcome the challenges this presents in delivering a first rate service to you all. As Nick Salter, President-elect, prepares to assume the Presidency at the end of June, he would like to hear your views on the subject of “Diversity”. For the purpose of this survey, diversity will be taken to mean: age, gender, geographical location, membership status and practice area. 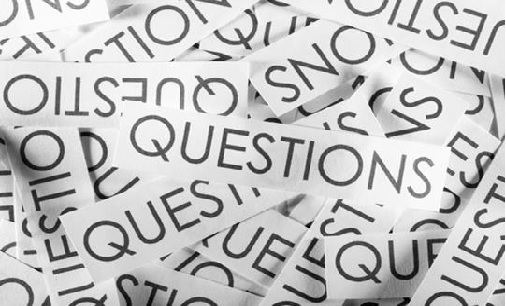 We would like to hear your views through a survey, which you can find here. Please sumbit your thoughts by 26 June. Our Beijing office has now opened! At the time David Hare and Derek Cribb were visiting Beijing, China during their May trip, the IFoA was granted a business license in Beijing, making it the first and only international actuarial association with a legal presence in the country. “Having legal status in China is immensely important to the IFoA as it will enable us to take the support we provide our members and students in the region to another level. 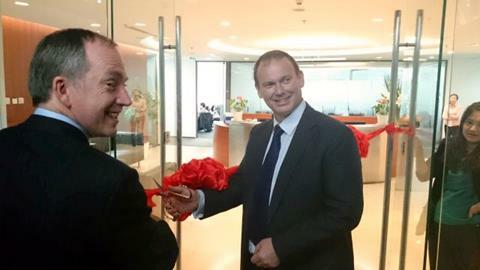 The picture above is David and Derek cutting the red ribbon at the opening of the Beijing office. Our Beijing office address is: 6F, Tower 2, Prosper Centre, 5 Guanghua Road, Chaoyang District, Beijing China 100020. President and CEO of the IFoA David Hare and Derek Cribb visited Beijing, China during their SE trip in May. As part of the trip, David, together with the CRO of Metlife in Beijing Mr. Zhang Ge and the first FIA in China Mr. Zhao Xiaoqiang held an event together at Central University of Finance and Economics (CUFE). IFoA have been having close links with CUFE for the past 20 years and both Zhang Ge and Zhao Xiaoqiang were past graduates from CUFE. The event was part of a series of presentations arranged for students at CUFE. It focused on the experiences of being appointed actuary and the responsibilities held as a senior figure in the insurance companies. David was the first to share his experience as the appointment actuary at Standard Life and now a partner at Deloitte. Zhang Ge and Zhao Xiaoqiang then shared their success stories with the students. David Hare and Derek Cribb also visited University of International Business and Economics (UIBE) in Beijing. UIBE is the first university in China having obtained all 8 CT subjects exemptions from the IFoA. 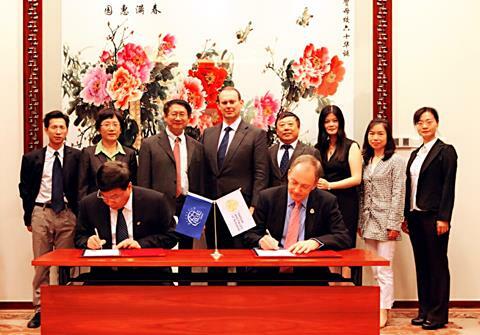 David and the president of the UIBE signed an exemption agreement. On 10 June, Xiao-Xuan(Sherwin) Li, the Career Ambassador for China region, visited Beijing Technology and Business University in Beijing. 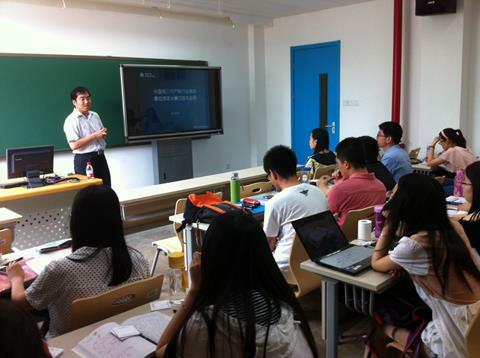 He made a presentation to the students about China's Risk-Oriented Solvency System(C-ROSS) and its impact on China insurance industry. He introduced the background and the latest development of C-ROSS to the students and compared C-ROSS with the international counterparts such as EU Solvency II, US RBC and Japan RBC. The audience showed great interest in the topic of C-ROSS and there was a lively exchange with the speaker during the Q&A session. The Momentum conference is aimed at nearly and newly qualified actuaries across all practice areas. The key themes of this year’s conference are: Looking to the future; Adapting through change; Transition and evolution and Career development in non traditional areas. More information will be available shortly, which you can view on our website. A key event for your CPD diary this year is the International Mortality and Longevity Symposium, 15 - 17 September, Aston, Birmingham. This Symposium will be of interest to all those concerned with pricing or reserving for mortality and longevity, underwriters, demographers, epidemiologists, policy-makers, gerontologists, other medical researchers, and all those with an interest in better understanding and projecting mortality and longevity. You can find out more information and book your place on our website. On 9 May 2014, David Hare, president of IFoA and Derek Cribb, CEO of IFoA attended a joint IFoA and New China Life Insurance event in Beijing, China during their China and SE Asia visit. More than 35 local IFoA members and New China actuarial team attended the event, which was opened by Chief Actuary of New China Life, Mr. Gong Xingfeng. David was first to give presentation on The Management of UK with profits Funds), detailing the features of UK with profits, their managements, especially the roles of the board and the regulators in the UK. Afterwards, the partner of PwC in the Asia Pacific region, Mr Jin Peng presented a similar talk on China’s with profits funds and lessons can be learnt from the UK. 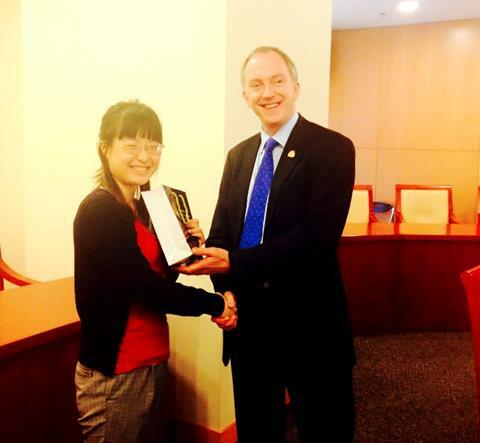 Before closing, David also presented qualification prize to the newly qualified Emma Wang in China. The event closed with an animated and lively discussion among IFoA members. New China Life is the third largest insurance companies in China and one of the 4 insurance companies which are listed in the stock market. The picture shows David Hare awarding a prize to the newly qualified Emma Wang. We are looking for a representative to help us support students and qualified members in South Asia. The role holder will be the lead representative of the IFoA in the South Asia region including India, Singapore, Malaysia, Pakistan, Bangladesh, Mauritius, Indonesia, Philippines and Thailand. They will ensure the IFoA proactively engages and builds links with key stakeholders in the interests of our members and particularly focus on developing a market for the new Certified Actuarial Analyst qualification (CAA). The successful candidate will be an Actuary with business development experience, fluent in English with Malay or Mandarin to business level and demonstrate an understanding of local regulatory environment and financial services. If you are interested in finding out more or wish to send your CV with a covering letter detailing why you are a suitable candidate, please contact Trevor Watkins, Director of Education or Alex Elvin, Head of HR. Closing date for applications is c.o.b. Thursday 10th July 2014. All interested members should log on to the volunteer vacancies webpage to find out more about these and other volunteer opportunities, or contact Debbie Atkins, Head of Volunteer Engagement. There are a variety of different volunteering opportunities within the IFoA no matter where you are based in the world. Please view the volunteer vacancy page on our website to see more information on the roles and how you can get involved. Join the reserve list for the 400 club. The IFoA’s International Board supports the delivery of the IFoA’s international strategy through the provision of strategic proposals, the facilitation of effective communication on international matters and overseeing the IFoA’s international representatives. At its last meeting board members conducted a ‘deep-dive’ in to international regulation by the IFoA and will do the same for member support at the next meeting. Should you have any queries about the work of the International Board please contact Rebecca Deegan. The IFoA has responded to the recent IAA consultation on ISAPs 5 and 6, which pertain to ERM, the response can be found on our website. The IAA is undertaking a significant review of its governance. It is encouraging all of its committees to produce a work-plan for the year ahead. This will feed into a dashboard, which is underway, to help to define the IAA’s goals from the top down. The IFoA is looking forward to welcoming our colleagues from across the world to the September IAA meetings in London. Changes are coming to how you pay for your exams! For those who pay by card, changes are coming to the way you pay for your exams. 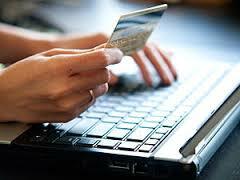 From Monday 14 July we will no longer be accepting any card details on the September exam entry application forms. Many of you already book your exams online via the website, and we would like to encourage everyone paying by card to do the same. This is the quickest, easiest and most efficient way to book your place. If you experience any problems booking your exams online, please call the Education Services Team on: +44 (0)1865 268207 who will be able to take your booking over the phone. We are working towards making all our education services bookable online, and we will keep you updated as we change our processes in other areas. There are several corporate publications that members may be interested in; such as the Annual Report and Financial Statements for 2012/2013. You can view these documents below. You may also be interested in reviewing our Corporate Plan 2014/2015.